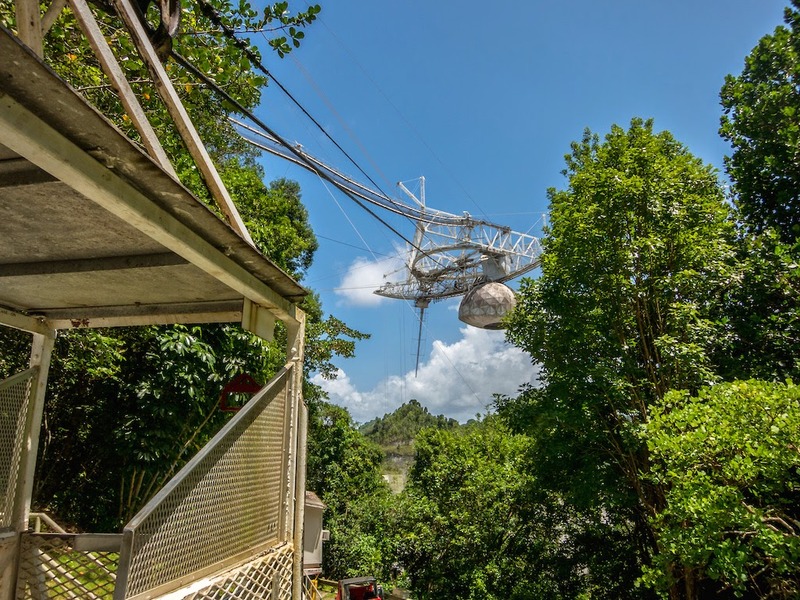 So you are at Arecibo Observatory and you want to get onto the platform, but don't want to go on what is locally known as the "catwalk?" No worries, there's the cable car! 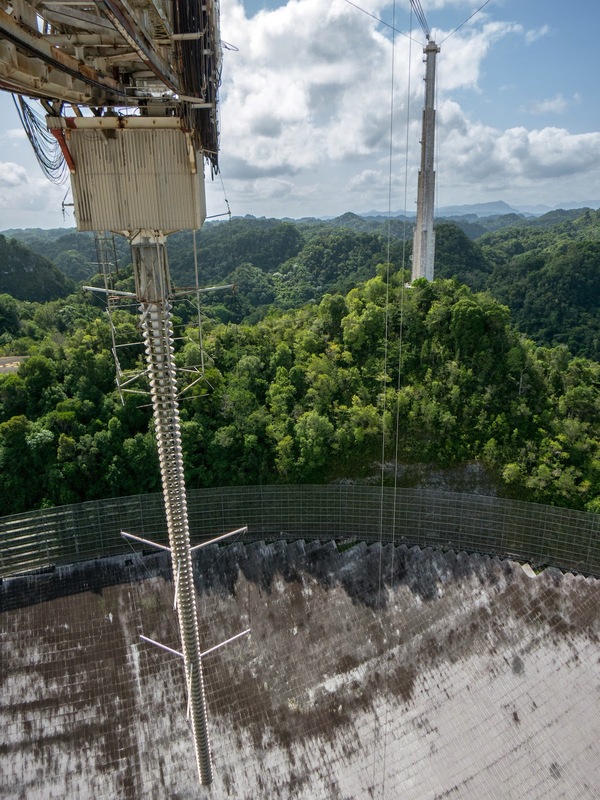 The first photo, taken from the platform, which is suspended some 150 metre above the 305-metre main reflector of the Arecibo radio telescope / radar, shows the catwalk leading away from the platform down to the visitor centre on the right of the image. Also at the visitor centre is one of the three towers, from which the platform is suspended. To the left of the tower, the group of buildings in the adjacent valley, are the main administration and science building as well as the control room. 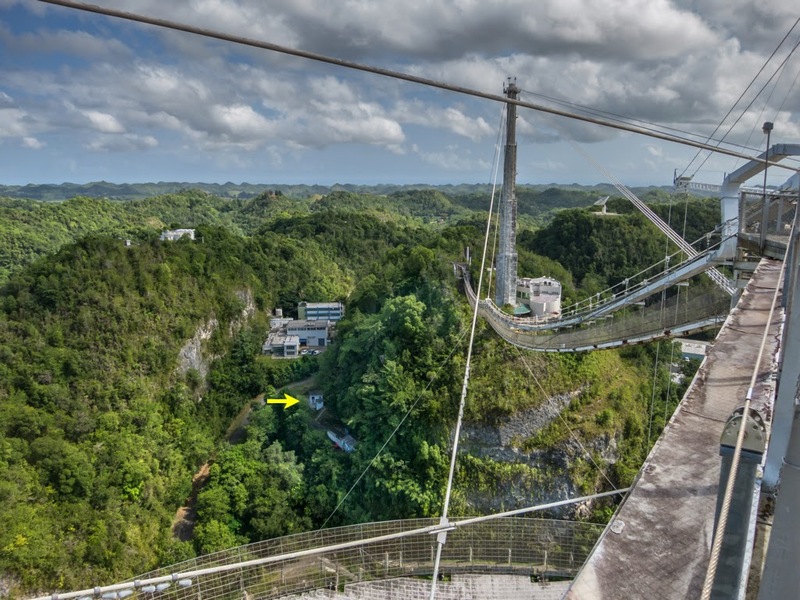 Below these, there's a tiny (from this perspective) white building, which is the ground station of the cable car, indicated above by the yellow arrow. If you look really carefully (and click on the photo to zoom in), you can just make out the cables running down from the platform. Here's the ground station of the cable car. Here there's only one, not two balancing each other like in commercial applications. Also, it is very small and the carrying capacity is limited. We were not offered a ride, since the cable car is undergoing maintenance. The cable car, on its way up to the platform, cuts in between the tree tops and then moves out over the main reflector. Another view from the top, just from the point where the cable car docks at the platform. 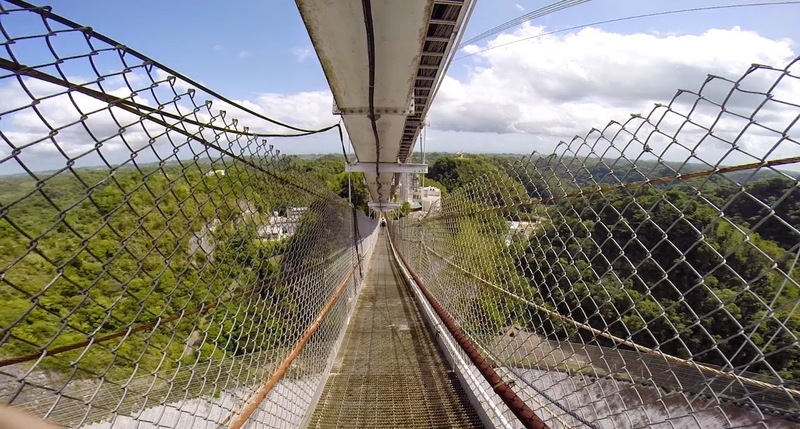 This wide-angle view shows the cables on which it is suspended, and the catwalk leading away on the right. 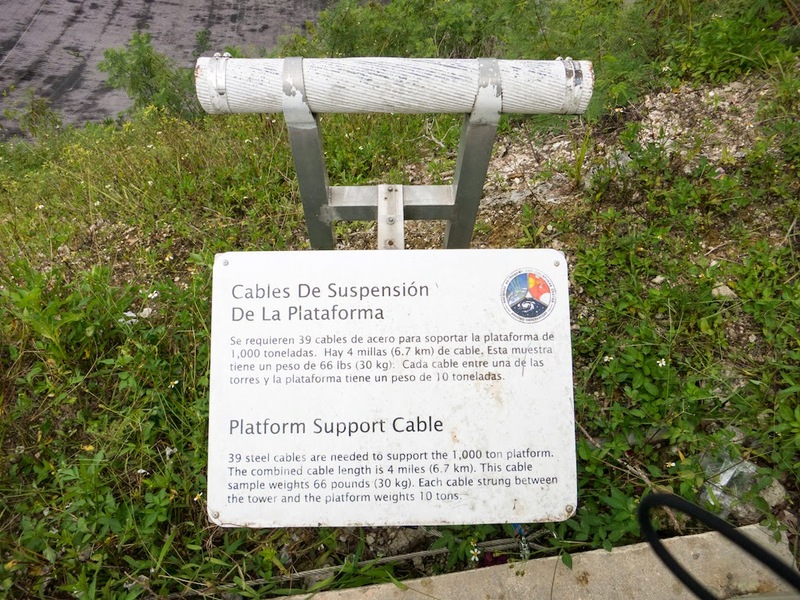 The catwalk is not only for people, all of the communication cables, electricity cables, and the high-power radar transmitter waveguide are reaching the platform via the catwalk. Finally, here's a rather simple video taken with Craig's GoPro, which has a 170° field-of-view (diagonal), and gives an interesting perspective of the view on the way down from the platform. By the way, the funny shadows in the lower corners are my fingers, since I was holding rather tightly on to the camera in order not to loose it! Sorry about that. Click the image for the video. Photos & video: Thomas Ulich. 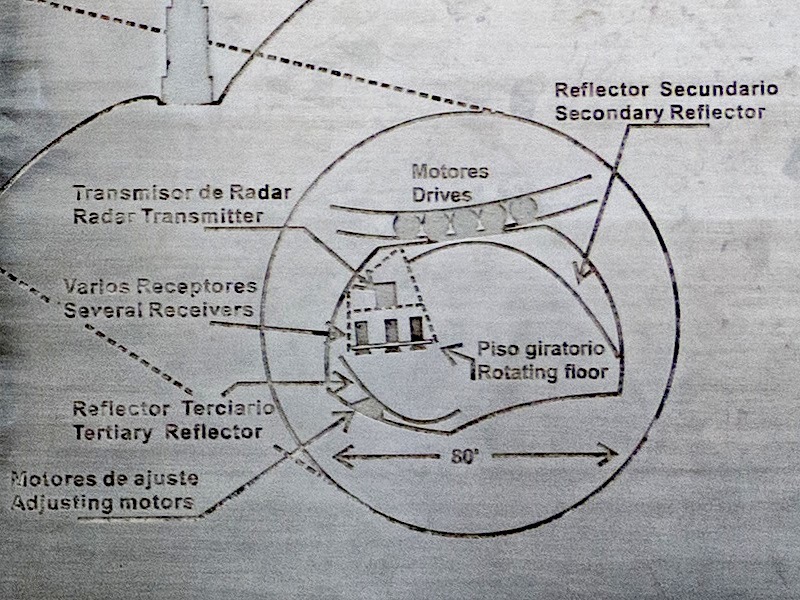 The Gregorian feed of the Arecibo Incoherent Scatter Radar is made up of the actual transmitter-receiver system as well as the secondary and tertiary reflectors. The primary reflector is, of course, the 305-m main reflector. Thus the reflectors are numbered in the order in which the received signal hits them and not, as one might think, in the order the transmitted signal hits them. 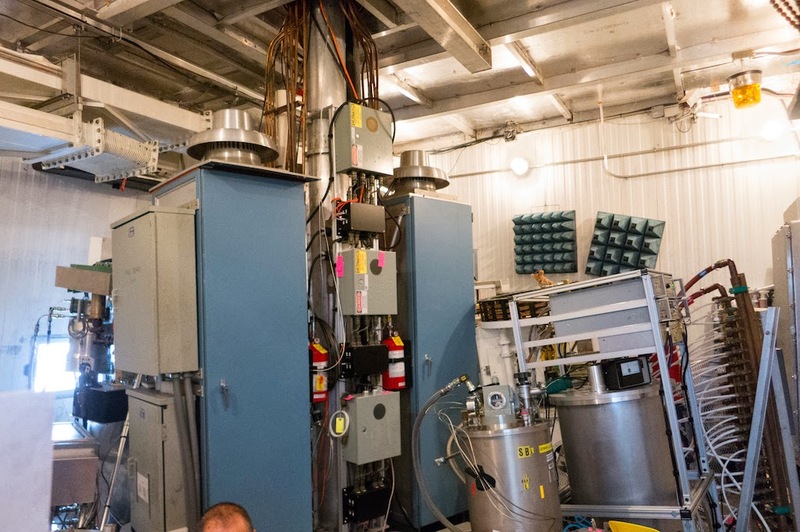 This might have to do with the antenna being mostly (in terms of operating time) used for radio astronomy in a passive mode without transmitter. The photo above shows the view from within the Gregorian. Clearly visible on the outside is the primary 305-m reflector on which the shadow of the suspension cables and the edge of the platform are visible. Inside one can see just the lower edge of the secondary reflector (the shiny one on the top edge of the photo), and the tertiary reflector on the bottom right. 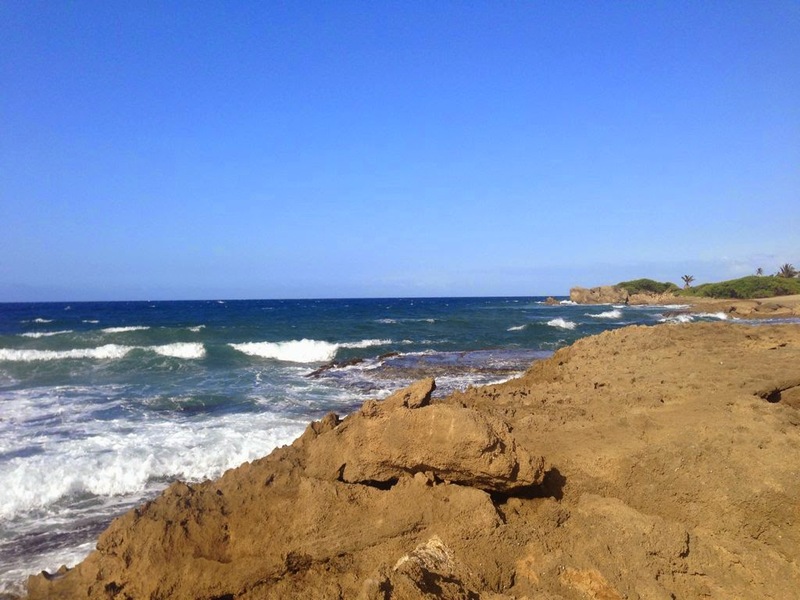 Due to limited space, one needs a really wide-angle lens to take these images. This is taken with Craig's 170°-field-of-view GoPro Hero 3+. The secondary reflector is on the top dominating the image, and the tertiary mirror is bottom right again. The next photo shows the tertiary reflector, with the lower edge of the secondary mirror in the background. 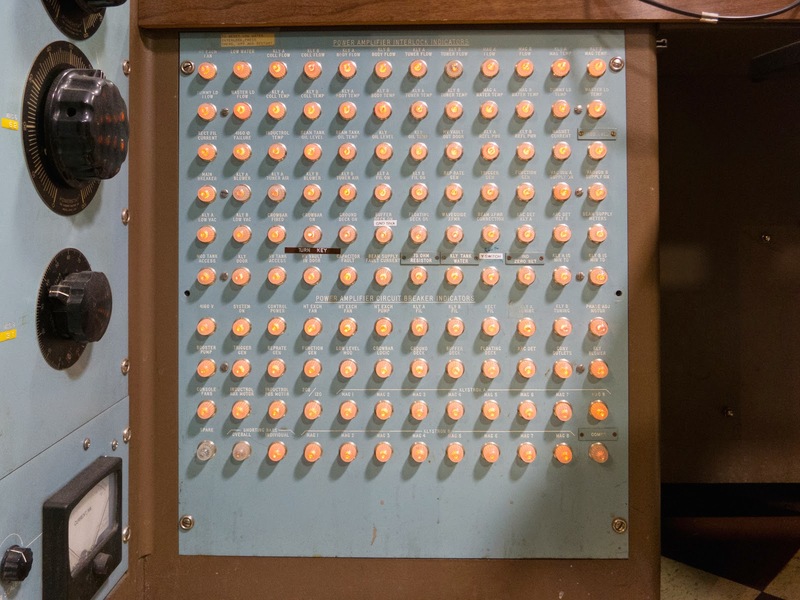 Finally a photo from inside the transmitter housing, which is within the Gregorian. Unfortunately there was work in progress and we couldn't enter and take more photos. 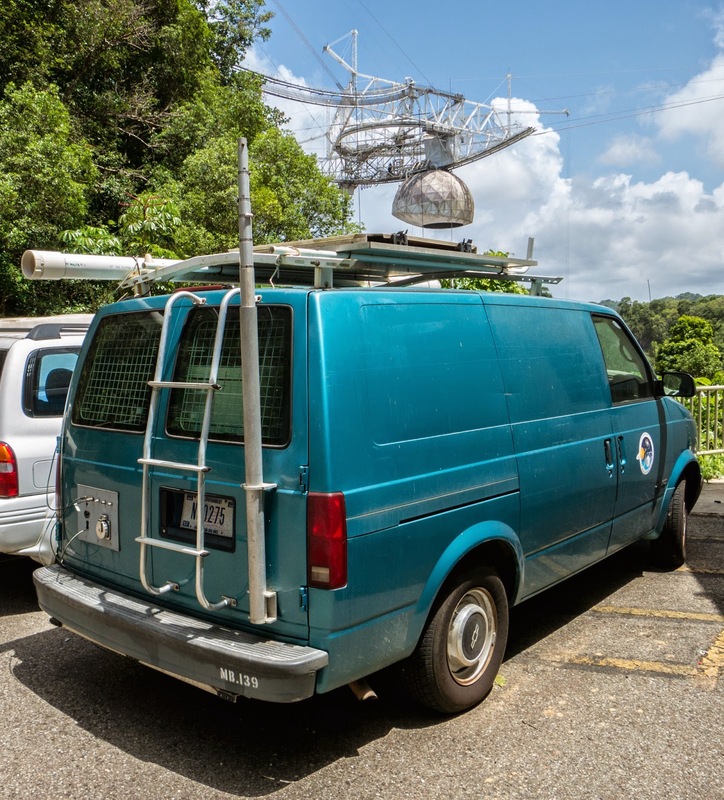 Recently, we reported on the line feed of the iconic Arecibo Incoherent Scatter Radar. 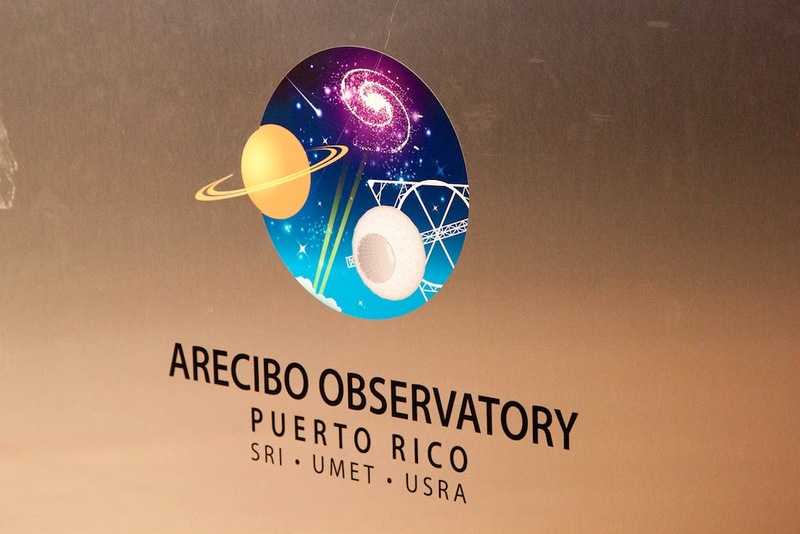 The Arecibo Observatory hosted this year's Joint US-EISCAT ISR School. This post is dedicated to the Gregorian feed, i.e. the "ball shaped" one on the right. Both feeds can move along the curved rail from the centre of the structure all the way to the edge. This is equivalent of steering the beam 15° off zenith (from 90° to 75° elevation). In addition, the entire curved rail can be rotated horizontally in a full circle providing said 15° steering in all directions. 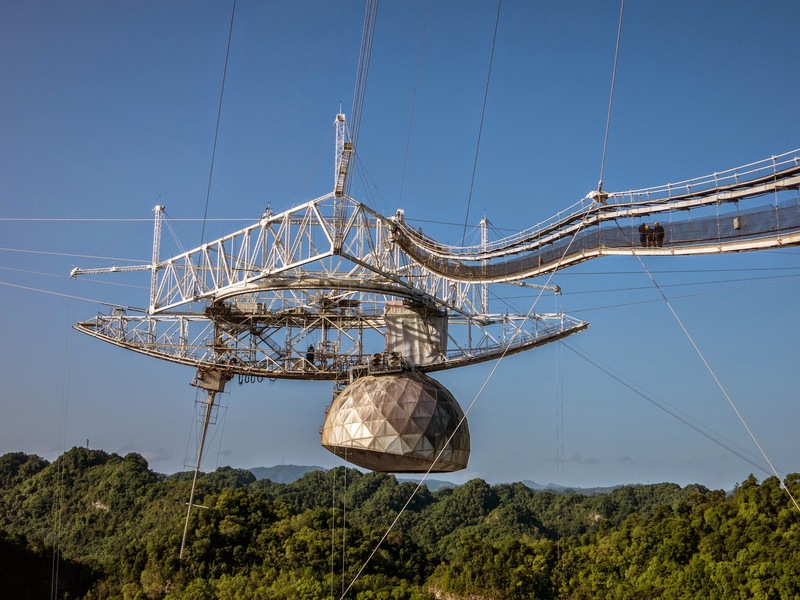 Everything about the Arecibo antenna is hard to grasp, esp. the sizes. Even when standing right next to it, on the visitors' viewing platform, one cannot really guess how large the feeds are. 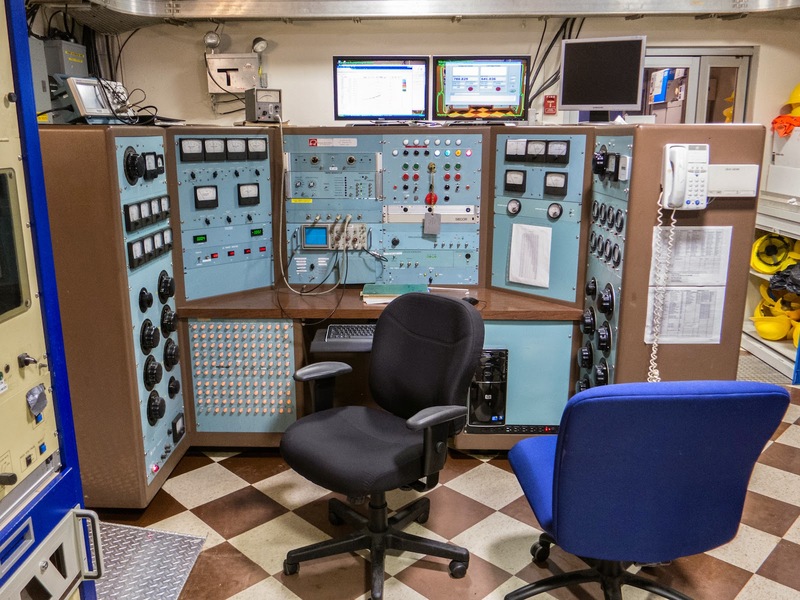 The Gregorian feed is 80 feet across, i.e. 24.4 metres! In the photo above, you can see a set of two access doors on the left of the Gregorian dome. These are regular double doors, i.e. about 2 m in height! 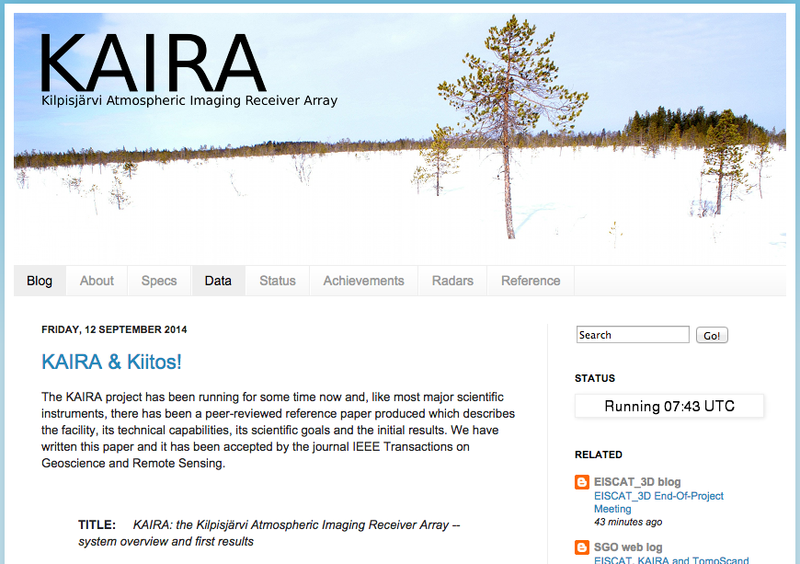 By the way, the line feed in the first photo is 36 m long, i.e. 50% longer than the diameter of the Gregorian. Here's what it looks like from underneath. This photo was taken from the bottom of the sink hole, in which the main reflector is suspended during our recent trips to the Underworld. There's a hole in the reflector down there, from where it is possible to look straight up and into the Gregorian feed. The mesh-like structure protruding within the Gregorian from the bottom right (about 4 o'clock) direction is the underside of the tertiary reflector. 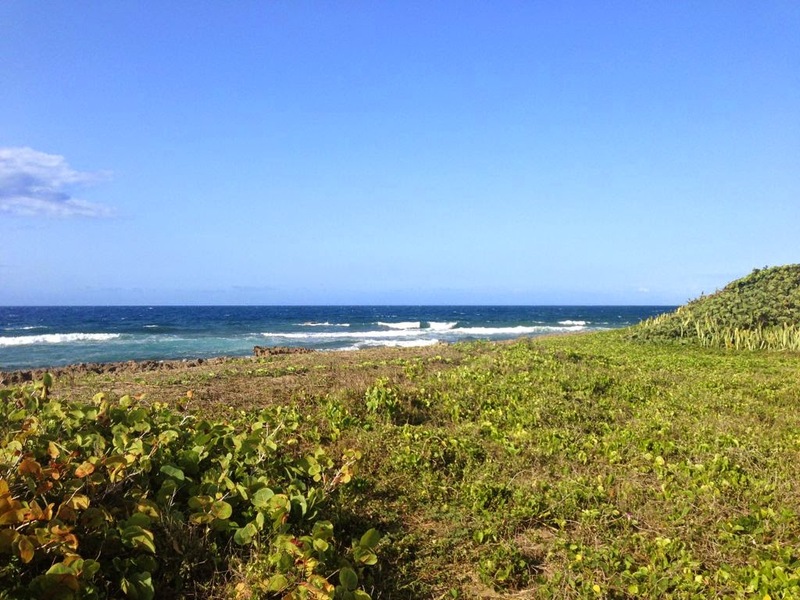 This year's Joint US-EISCAT Incoherent Scatter Radar School at Arecibo Observatory has come to an end. The school was set up such that every day there were lectures followed by group work. 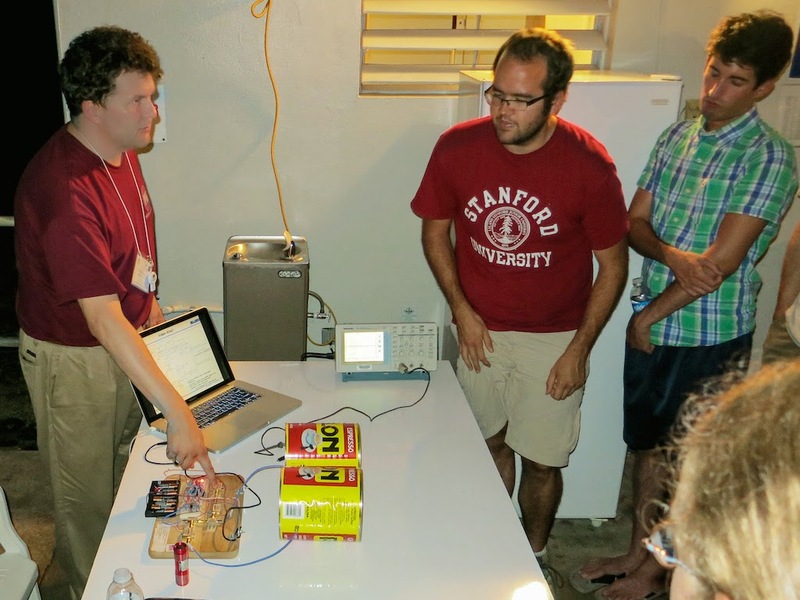 All participants were split into six groups, and each group ran their own experiment on the Arecibo ISR on Tuesday/Wednesday night. On Saturday, the last day of the school, the results were presented by each group. All groups did a great job, esp. considering the limited time they had. Just like last year, we time-lapsed the session, and the resulting video is online. Apologies to the group presenting first: unfortunately the camera ran out of memory only a few photos after setting up due to operator error (putting in the wrong chip). This was noticed and fixed only after the first group's presentation. The school has ended, but a few reports are still in the queue and will appear here over the coming days. Here we continue the descend into the space under the Arecibo 300-m reflector, which we began in the previous blog post. Again, it is hard to grasp the size of this facility. 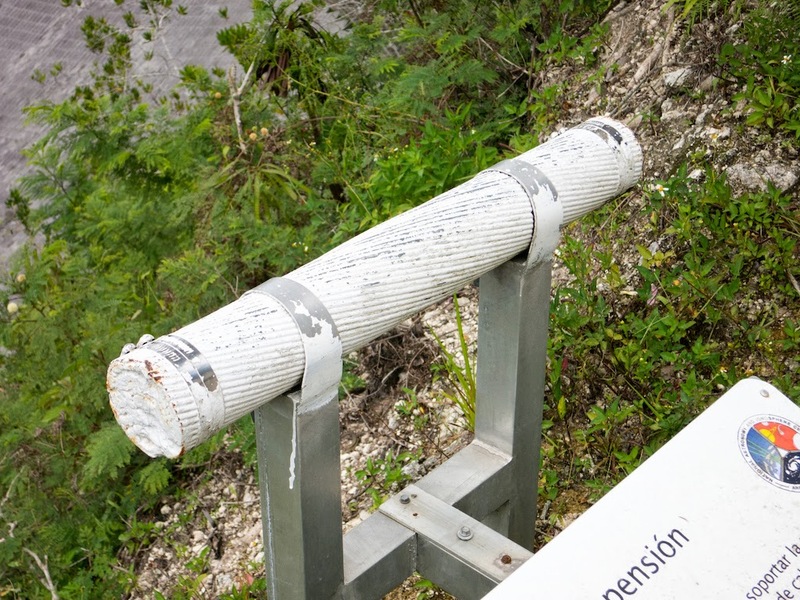 The photo above shows a panoramic image taken from the road about half-way down to the bottom of the sinkhole under the reflector. 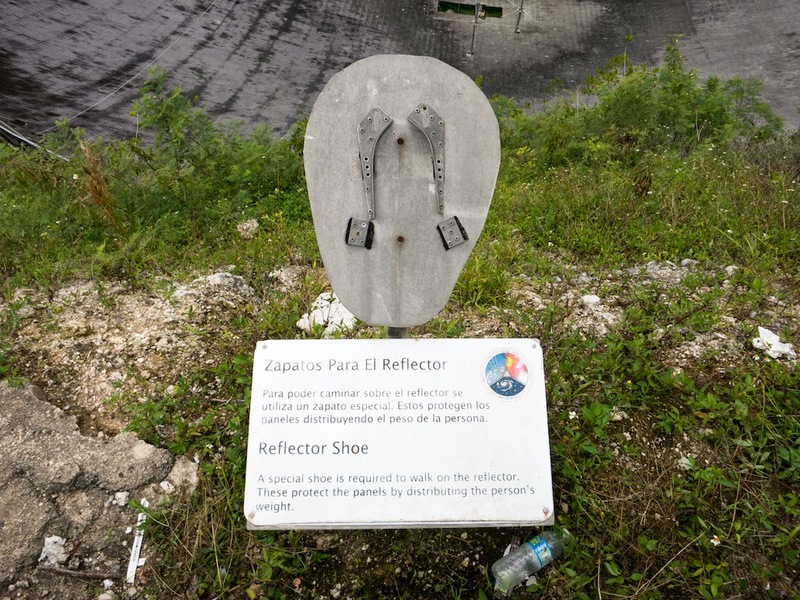 The reflector is kept in precisely spherical shape by a multitude of wires underneath, each mounted to a concrete anchor point. Now and again, the spherical shape is verified with lasers from the platform above, and then adjusted by tightening or loosening the wires underneath. There are three places under the reflector, where two cables go all the way up to the outriggers of the platform high above. These are stabilising the platform, and are mounted on the ground via a set of shock absorbers (above). In the centre of the reflector, there's a small platform one can climb on top of. When standing there, the bottom of the reflector is about waist high. Here's a super wide-angle photo taken from there towards two of the heating antennae. These are huge crossed dipoles, which will be used in due time for ionospheric active modification experiments. 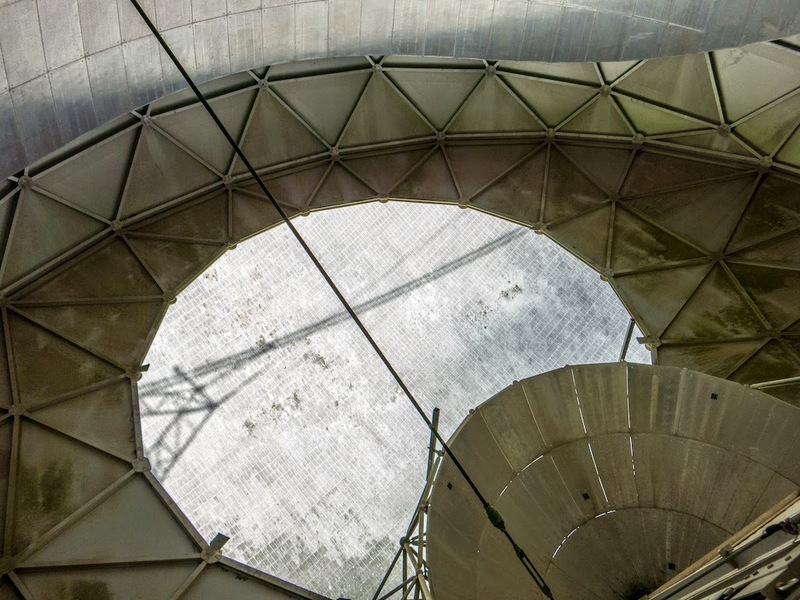 During the Joint US-EISCAT IS Radar School, some of us got the chance to visit the area under the huge 300-m reflector of the Arecibo radio telescope (click photo to enlarge). The reflector is atypical in the sense that it is not a paraboloid, but instead it is a spherical reflector, which allows for some limited steerability as mentioned earlier. 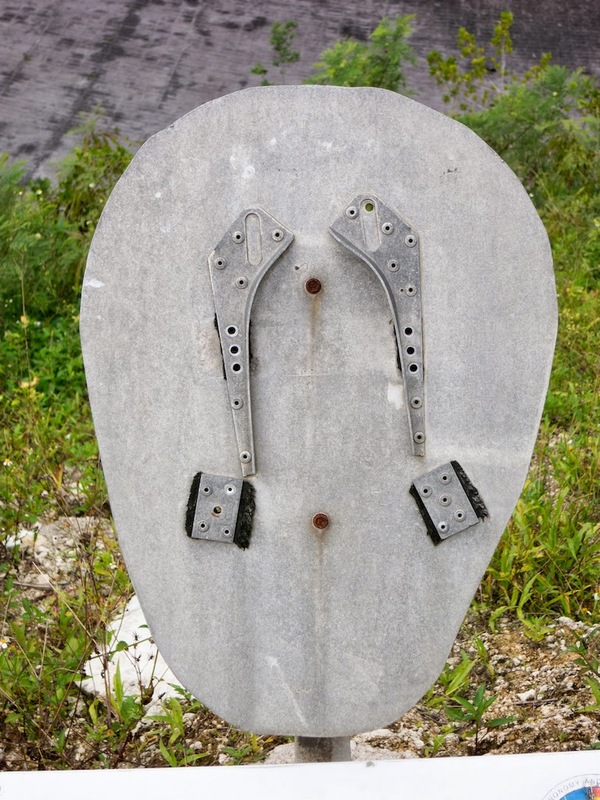 Once properly equipped, we were allowed to make the descend into the karst sinkhole, in which the reflector is embedded. All areas are accessible by car and thus it is easy to transport tools and other materials around, but only site-vehicles are allowed here. The reflector is made of aluminium sheets, which have lots and lots of holes in them to form a very rugged mesh. This construction allows for water – and light – to pass through the structure. 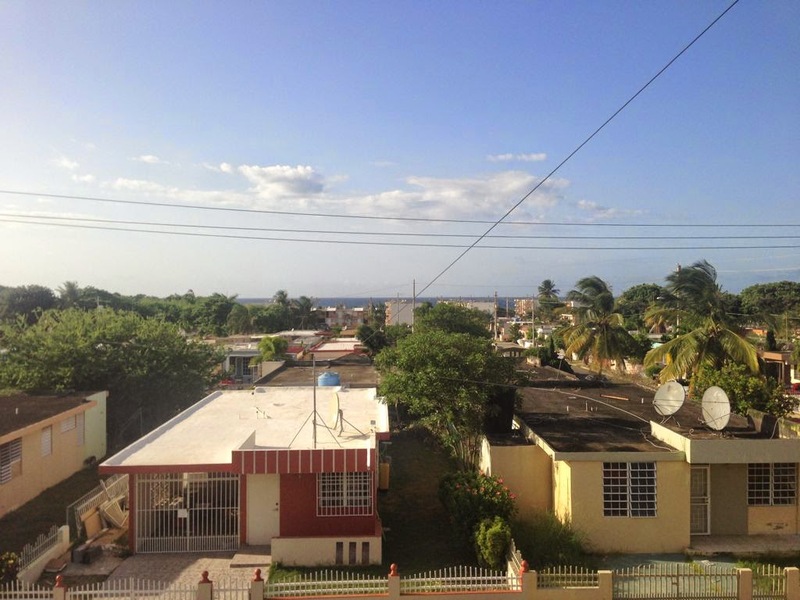 In fact, in tropical Puerto Rico, rainfalls can be extremely heavy with some six inches of rain in less than an hour. From the karst sinkhole in which the dish is embedded, water can be pumped out into a near-by river in order to prevent flooding. The photo above shows the road down to the bottom of the sinkhole under the reflector. 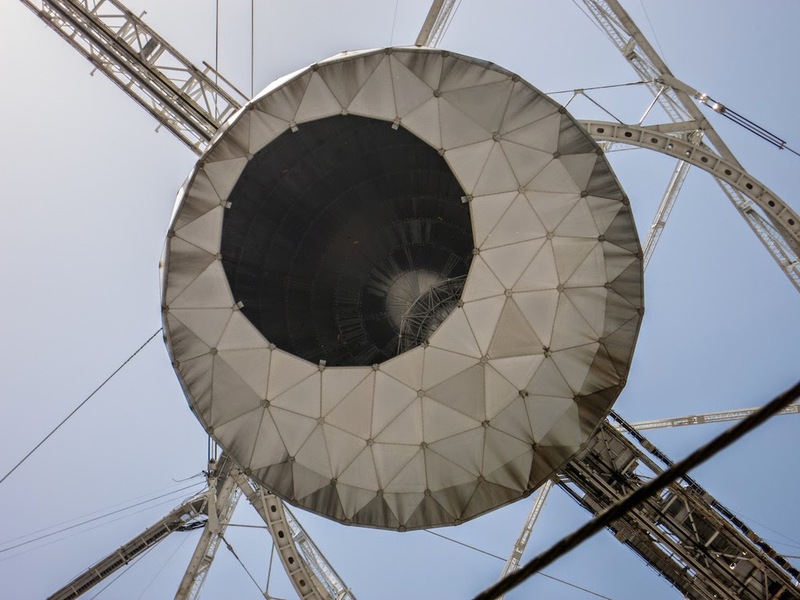 Above it the curved, spherical structure of the reflector, the shadow of which gives and idea on how it is constructed. 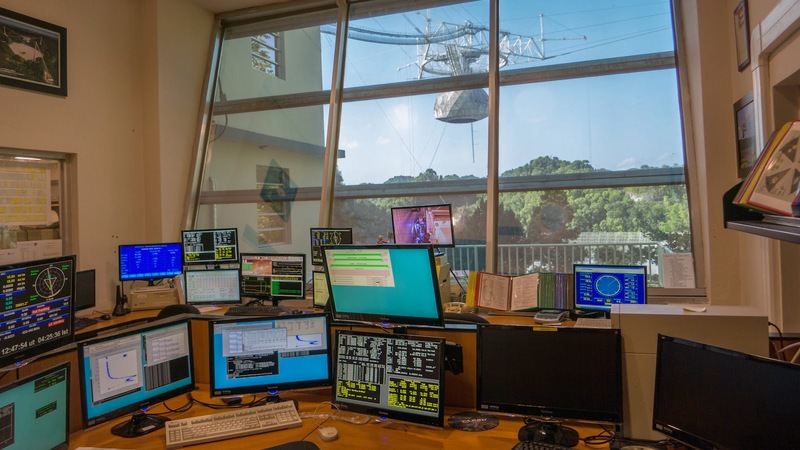 At Arecibo Observatory, where the Incoherent Scatter Radar School is currently under way, there is strict radio silence. This means there are no wifi networks at all, computers are only allowed to connect to the internet by cable. Also, mobile phones are not allowed to be turned on here (flight mode is ok). Also, we have been told that hair dryers, which often have cheap motors causing a lot of interference, are not allow on site or indeed in the observatory's guest houses. 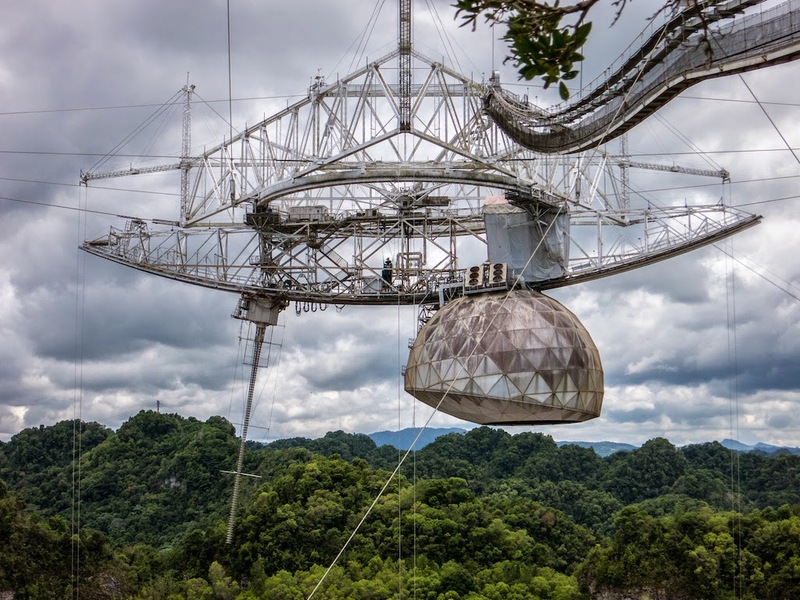 The reason for this is of course that the Arecibo antenna, which functions not only as a radar but also as a powerful telescope for radio astronomy, is so highly sensitive, that certain observations are not possible with mobile communication all over the place. 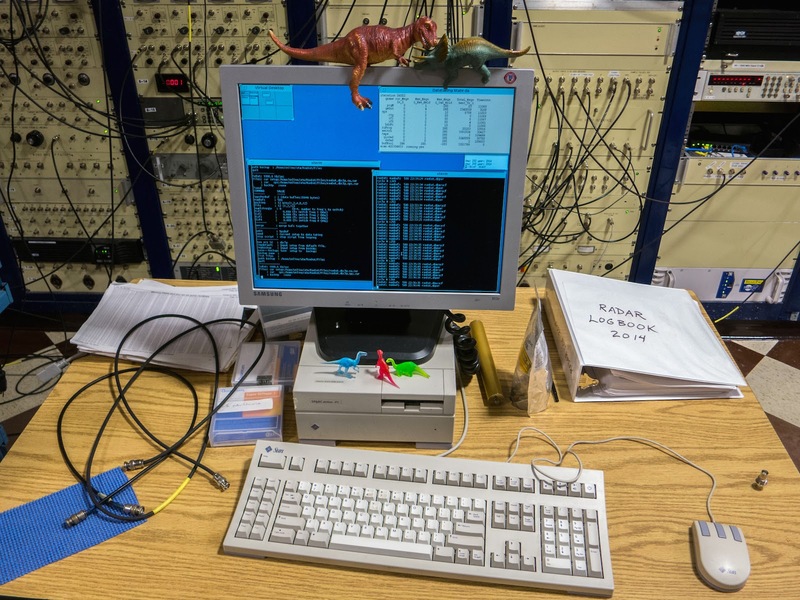 In case a measurement is disturbed by radio interference, the observatory has a dedicated vehicle equipped with receivers for hunting down the source of the interference. Click on the photo for better resolution, and look carefully at the roof of the van. There's an array of four antennae for direction finding. So beware if you turn on your phone, these guys will come after you! 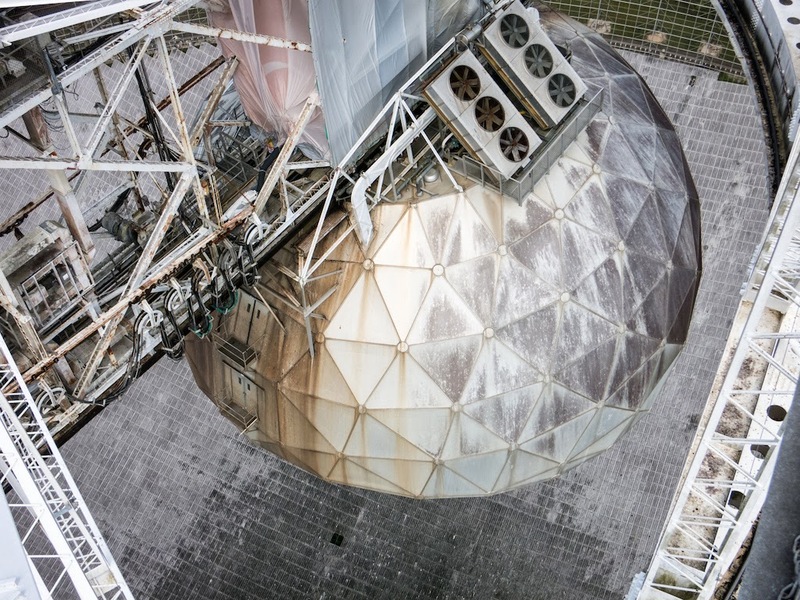 The main reflector of the Arecibo Incoherent Scatter Radar is not, like other radars, a parabolic dish, but a spherical dish. The reason for this is that the main reflector cannot be steered at all. 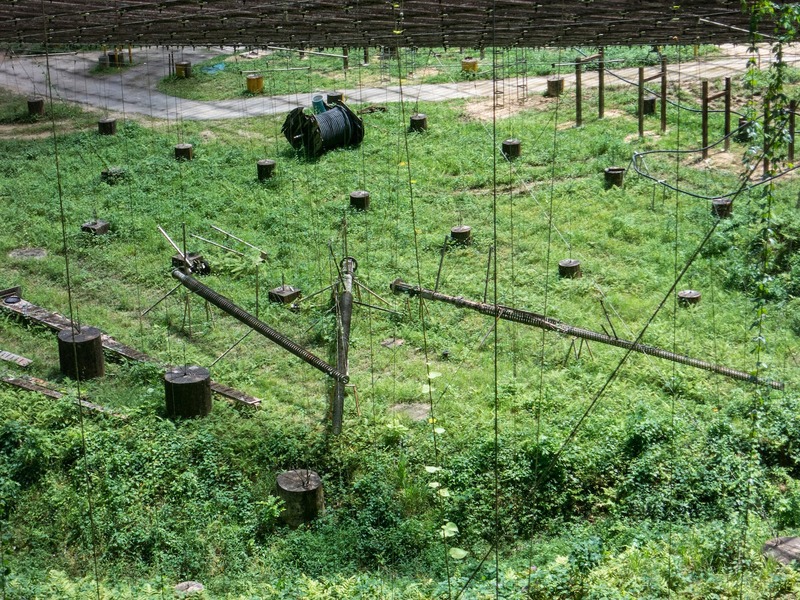 Instead, the feed system can be moved into different positions under the platform suspended above the reflector. This allows for zenith angles up to 15° from vertical. A sphere, however, has a focal line rather than a focal point in the case of a paraboloid. Therefore, the feed must be along a line, which is placed such that it matches the focal line of the sphere. This line feed is visible in the photo above, it is the long "stick" to the left of the Gregorian dome, pointing down from the curved slider along which it can move. It is hard to grasp the size of these structures from photographs. Even when standing at the edge of the radar, i.e. some 150 m away from the platform, it is hard to realise how big it is. If you look carefully you'll see some people on the gangway (called "catwalk") up to the platform. The line feed is indeed 36 m long, i.e. 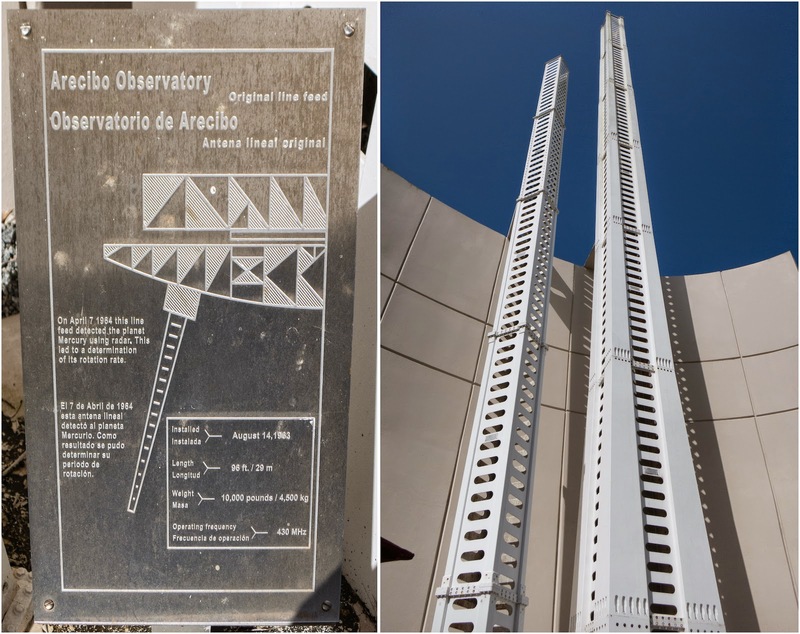 it is 4 m longer than the EISCAT UHF radar dishes are in diameter! Above another photo taken from the platform looking down and towards one of the masts from which the platform is suspended. 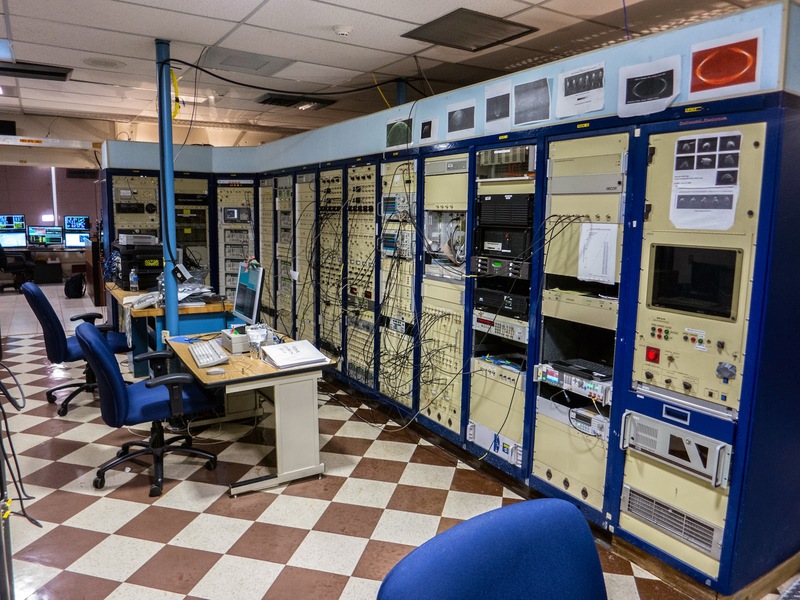 Here is a photo of the very first line feed used at Arecibo. It is cut in half and hidden in plain sight, disguised as some modern art piece right next to the Learning Centre, i.e. the building in which this year's US-EISCAT ISR School is housed every afternoon. 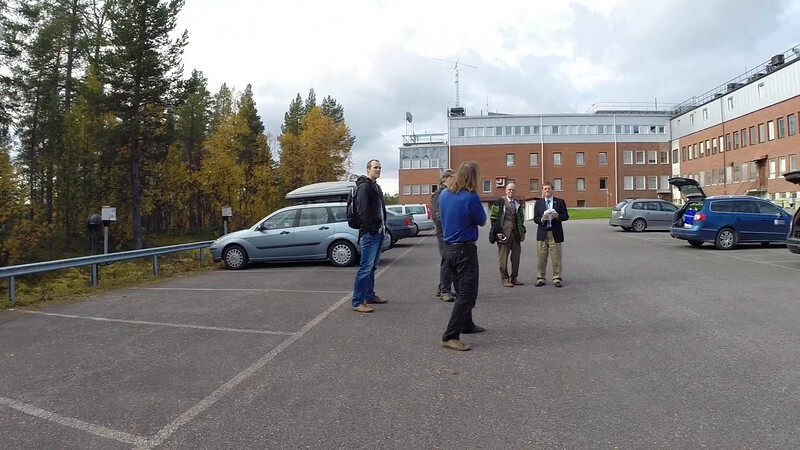 Some of us got the chance to visit the space under the 300-m reflector, the report of which we will leave for a future blog post. However, under the reflector we found these pieces, and Rich Behnke commented that "this is where line feeds go to die," meaning these are old line feeds not in use anymore. 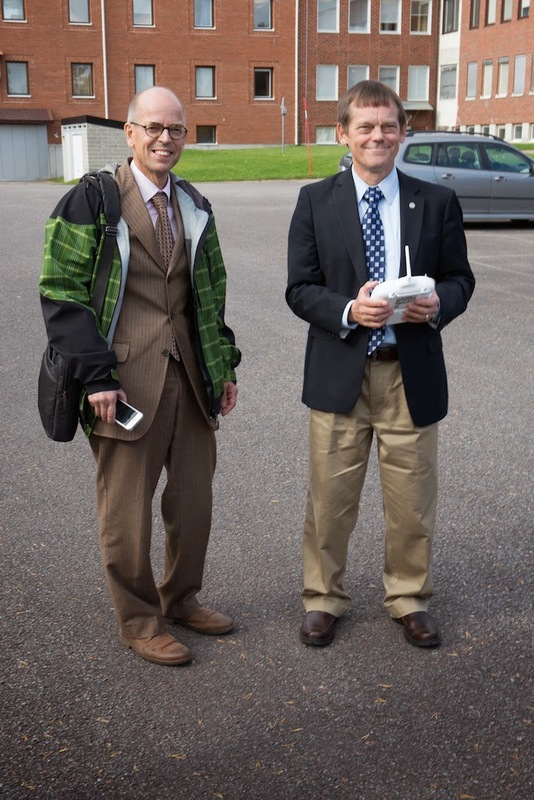 One of the favourites of the radar school, and a bit of a tradition already, is the cantenna radar system. 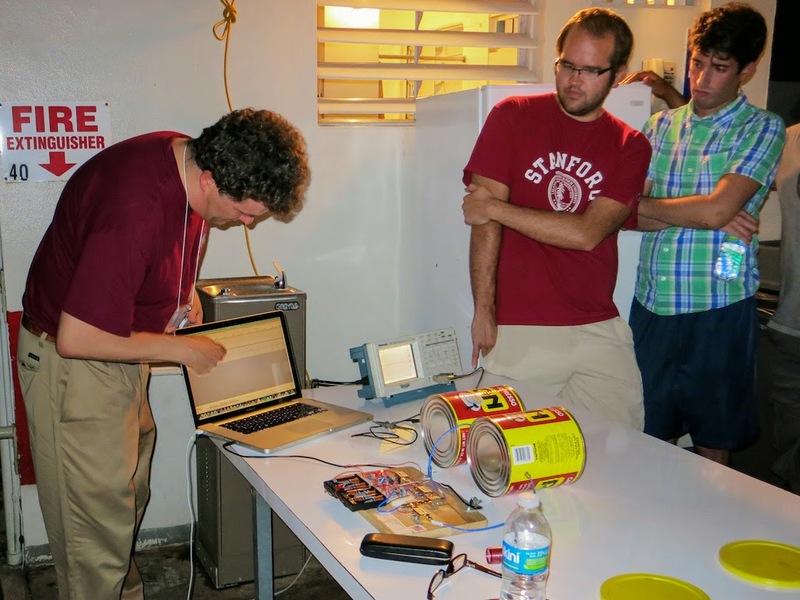 It was first shown by Phil Ericksson of MIT Haystack (on the left) at the ISR School in Banff, Canada, in 2012. 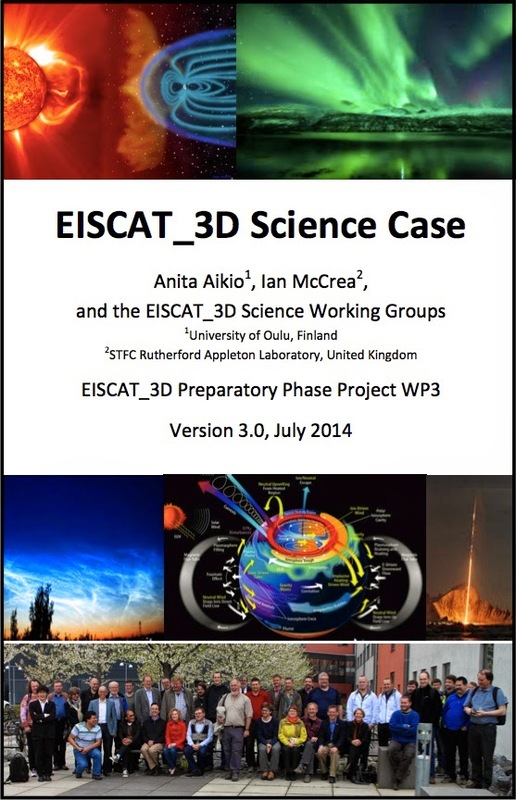 The experiment was then repeated at the EISCAT Radar School in Sodankylä in the same year, and then again in the 2013 ISR School, which took place at MIT Haystack Observatory. On the wooden plate on the left, using some very low-cost components, a basic radar operating at 2.4 GHz has been put together. It runs on a bunch of AA batteries. As transmit and receive antennae, a couple of coffee cans are used, and that's where the term "cantenna" comes from. 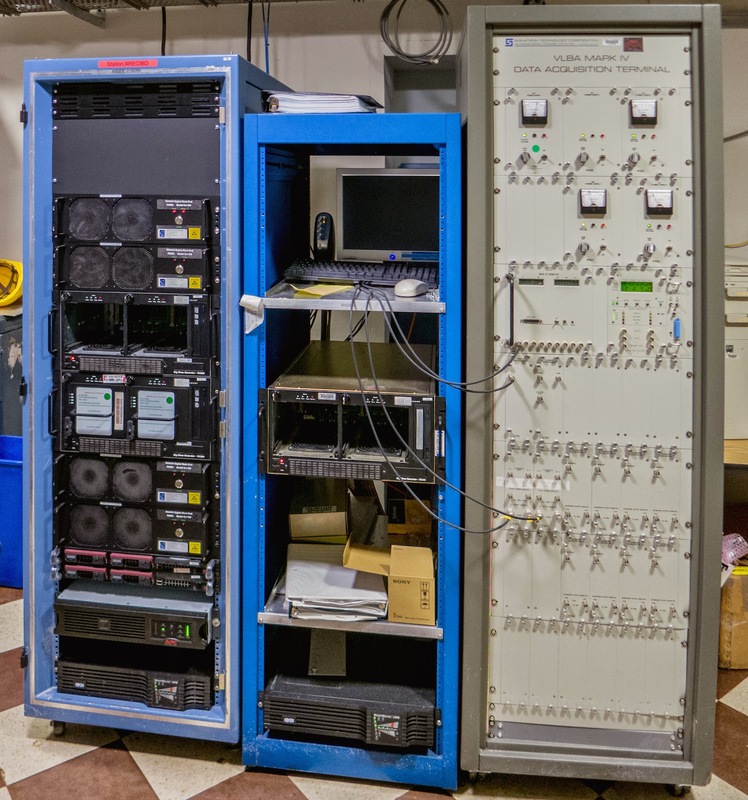 The radar can operate in two modes, between which one can switch by placing the end of a cable into a different hole in the circuit board. One of these modes is the Doppler Mode, which gives the velocity of the target, but it cannot tell the distance to the target. The other mode is the Range Mode, which tells the distance to the target, but not its velocity. 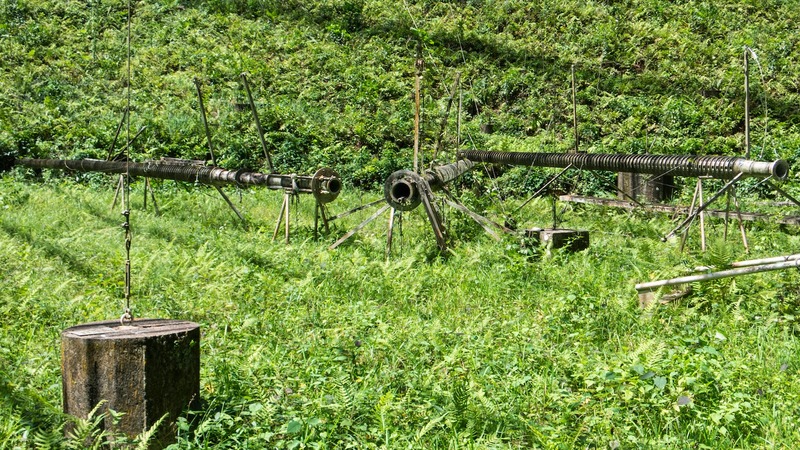 A few of the participants serve as targets by running towards and away from the cantenna radar. The data is recorded and digitised using the audio-in (microphone) port of a laptop. Thereafter, the data is analysed and plotted with a rather simple Matlab script. 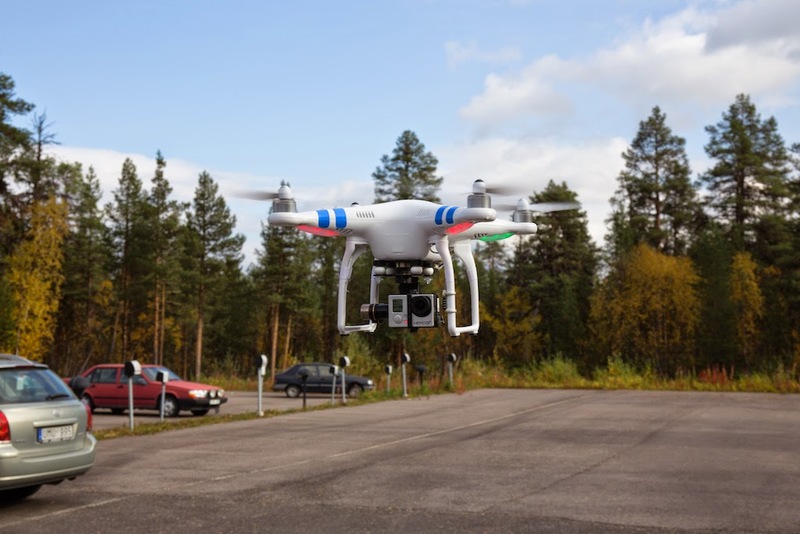 The original idea comes from a course developed by Greg Charvat and Alan Fenn of the MIT Lincoln Laboratory, and the course materials and instructions are online at the MIT OpenCourseWare site.